Hold it anywhere you want it! This professional quality vise will undoubtedly be the most used and useful tool on your workbench. Panavise tilts, turns and rotates to any angle or position with one turn of the control knob. The vise base is pressure-cast aluminum alloy with steel and brass inserts. Variable load control knob and exclusive split ball feature permits moving work to any position. The Panavise Wide Opening Head opens a full 6 inches with a jaw width of 1-3/4 inches. Satin black oxide finish greatly reduces glare. Reversible and replaceable neoprene jaw pads have molded ribs for firm, yet gentle holding power. 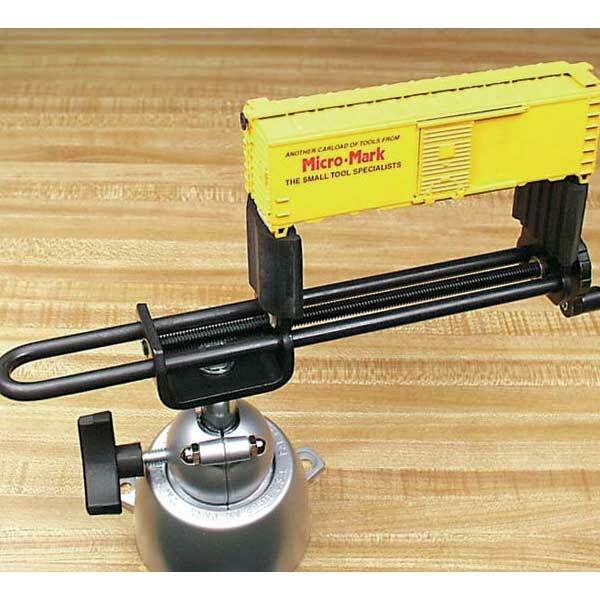 Ideal for holding model railroad rolling stock, cameras and other delicate items.